So what does a nice Italian girl from New York make for her nice Jewish husband for Hanukkah? 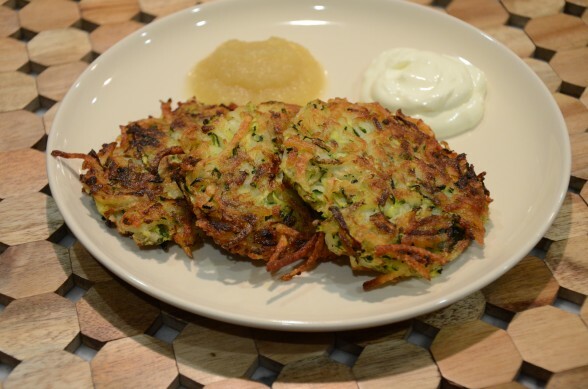 Zucchini-potato latkes, of course! Believe me, you don’t have to celebrate Hanukkah to enjoy these little patties. 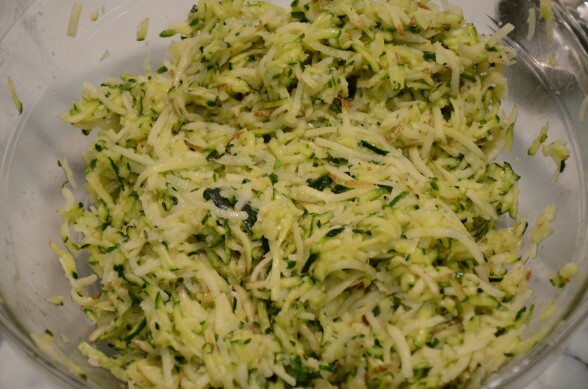 Grated potatoes mixed with a little onion and lots of fresh zucchini all fried to crispiness. Mr. Picky has declared that this is the only way he’ll eat zucchini. So be it. But uh oh. That fried bit does make latkes an “occasional” food, which is why we only indulge in them a mere once or twice a year. Even though frying is a rather unhealthful way to cook, I’ll do it since the latkes are so much more tasty that way. Russet or Idaho baking potatoes have the highest starch content and the lowest moisture content, which is good for making crispy latkes. But Yukon Gold (medium starch) work great, too. Wear disposable gloves so your hands don’t smell like potatoes and onions for a day. Squeeze out excess water from the potatoes — again helps to keep them crispy and keep them from falling apart. 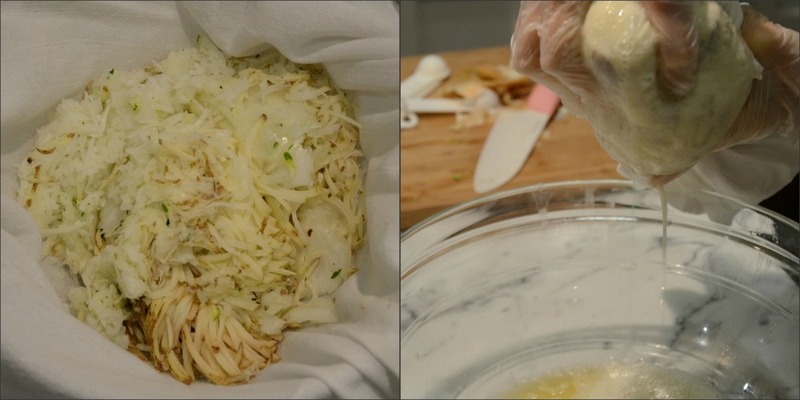 Use the shredding disc on the food processor to make this job a breeze. I also shred my onions (and zucchini), but my mother-in-law chops the onions and pulses them with the metal blade to avoid getting any big pieces. Don’t make them too big. The interiors won’t get fully cooked and they may not hold their shape well. Whatever you celebrate, here’s hoping your holidays are happy! Shred the zucchini in a food processor fitted with the shredding attachment and place in a colander over a large bowl (my preferred method.) Toss with 1 tablespoon kosher salt and allow to drain for 30 minutes. Call your kids to the kitchen so they can watch the next step. Place the zucchini in a kitchen towel and squeeze out as much liquid as possible. There's a ton! Do not add salt to the mixture again. Or shred the zucchini with the potatoes and onions. You will get out more moisture though if you salt them first. In the bowl of a food processor fitted with the shredding attachment, shred the potatoes and onions. Again, squeeze out as much liquid as humanly possible. Let the mixture rest for a minute and squeeze again. Place all the shredded vegetables in a large bowl. Add the eggs, salt (do not add if you salted the zucchini early), pepper and bread crumbs to the vegetables and combine well. Heat the oil (I use olive) in 2 large skillets until hot, but not smoking. An inch of oil will give you the best results. 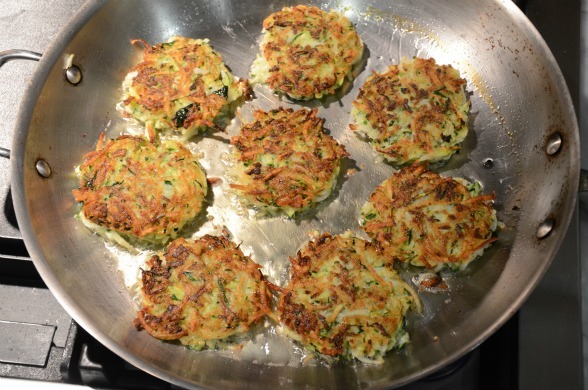 Using about 2-3 tablespoons of the zucchini-potato mixture, form the latkes into 2 ½-inch pancakes. Flatten slightly and carefully place into the pan. When the edges are brown and crisp, turn them over and continue cooking until deep golden. I usually flatten them slightly in the pan when I flip. Lay paper towels on a cooling rack or brown paper bag. Transfer the latkes from the pan to the rack. Sprinkle with sea salt if desired. Serve immediately with applesauce or sour cream (if you must). Preheat oven to 425 degrees. Brush a baking sheet with oil. Place formed (raw) latkes on baking sheet and brush tops with oil. Bake 10-15 minutes, or until undersides are golden. Flip latkes and bake another 10-15 minutes until golden on both sides. They won’t be as crispy as the traditional, but a good alternative if you don’t like to fry. Cook, cool and freeze immediately. Reheat at 425 degrees for 10 minutes or until heated through. Can you use a egg replacer (flax seed meal/water) instead of the eggs for a vegan version? I’ve used flax/water instead of eggs in baked goods many times with success, but I haven’t tried it with latkes. I really don’t see why it wouldn’t work though! This looks like a great recipe! I can’t wait to try it. Thanks for the tip about salting the zucchini. Happy Holidays! Happy holidays, to you too, Cristina! I hope you’re making something delicious in the kitchen! Mmmm!!! This looks yummy! I have to make these! They’re great! But if you have the time, I definitely recommend salting the zucchini for 30 minutes. The key with latkes is to take out the moisture before you start frying. Enjoy!